Just because you choose to own a classic car, doesn't mean you have to lock it in a garage for years on end. That's if you believe the folks at Historit, which stores dozens of classic and vintage cars for clients. Yes, the values of classic cars may be at a high, but there are people out there who think that classics deserve to be used and not hidden under a dust sheet forevermore. And Charlie Morgan, who runs the show at Historit, is one of them. We've spoken to him to find out exactly what goes on in Historit's enormous 300 by 150 foot hangar in Oxfordshire. What is Historit all about? Historit makes sure that the cars that we've got held here are going to persist for generations to come. And that's because we exist to help people use their motor cars. Not to store them and forget about them. But to be a facility that gets people to come here and get them on the road. We're fantastically lucky because we're slap bang south centre of England. We enable people to come here as often as they would like to and take their motor car out. 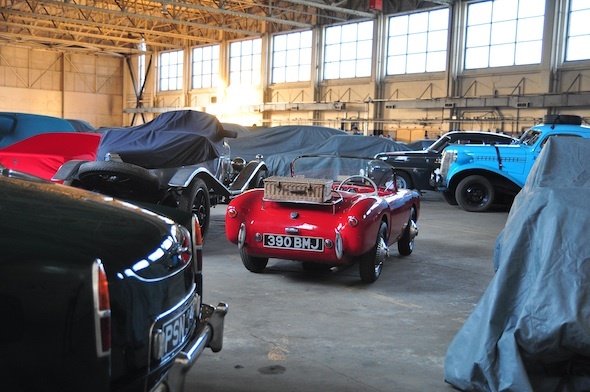 How does Historit differ from other car storage services? We want people to use their cars. There's nothing sadder than a car in a museum. They only really live when they're used. So we've put together storage which is inclusive, a total package approach to storage which makes sure that cars are always ready for owners to use. Cars are thoroughly checked when they arrive, they're cleaned and prepared. They have a very regular maintenance, the tyres are rotated, the batteries are regularly charged, the fluids are checked. The real benefit that we have on site, is that we have a small track around the back, which gives us a controlled environment to test vehicles. Vehicles are run monthly and exercised with a system check, which helps highlight potential problems before they become a problem. We've had a couple of occasions where elements have failed on a car while we've been driving them and owners are delighted that that's happened while we've been driving them and that they haven't been stranded. The building itself is our greatest asset. It is an enormous structure with a huge volume of air inside. The floor is 10ft thick, high-density concrete. In essence it's an enormous thermal brick which stabilises the temperature. The cars are always at the same temperature as the air in the building and therefore they get no condensation building up. That's the real killer for old cars. They don't rust here. We started in September, using word of mouth. The investors who bought the site are property investors, but fantastically keen car enthusiasts who want to use their cars. Rallying, trialling, racing...It wasn't long before we'd got an attraction. We can let you out on the track for testing too. The Le Mans car owner for instance hadn't driven it for a long, long time and wanted to reacquaint himself for the Festival of Speed. The track allows you to check if modifications are working. What type of person stores their car with you? We've got a good spread of clients, but the majority want to come and use their cars. For example we have a fellow who lives in London, he owns an Aston Martin, restored it here with us, we haven't seen him for a bit, but he sent his father and son. Ferg taught the 15-year-old son how to drive in his father's DB6, grandfather watched and took photographs and looked at the cars. Grandfather then said, "I tell you what, I'd love to go up in a glider", so we got him an experience flight. That is how we are different. People could potentially store cars at home. Why keep them here? We have a number of customers who have got to retirement age, perhaps early 60s. At that point of moving to a slightly smaller house, perhaps they have a little more money, have just had a retirement windfall and have always wanted a classic car, but have moved to a smaller house without a garage. They think, "I tell you what I'm going to build a garage". So they go through the numbers. It's £50,000. Even the interest on £50,000 is two or three thousand, four or five thousand a year. Well they could store their car here for less than half that. So from that economic point of view, it makes sense. We've got a very good number of Londoners. Space is a consideration. Often a change in circumstances too, such as moving house, or being posted overseas. They probably would be average age of 45 to 55, with an interest in a particular marque. We've got very few cars in here that are standard supercars. Owners have all got some sort of notable aspect to their cars, rather than it being yet another bog standard 911. We've got a strategy to create a business park that is dedicated to restoring cars and planes. And Historit exists as one of the anchors of the site to provide an incentive for other restorers and engineering specialists to come to the site knowing that there's a big market ready for them, on their doorstep. So you'd have marque specialists and then individual radiator, exhaust, engine magneto...specialists so you'd be able to have the majority of jobs done on your car when it's here. Fully fledged, you're looking six or seven years hence for the site to be fully developed. The odd restaurant, hotel, conference centre and visitor attraction will come in off the back of that. If you look at Bicester Village down the road – it's almost bar none the biggest retail destination in the UK.